Tuberculosis (TB) is a potentially fatal contagious disease that can affect almost any part of the body but is mainly an infection of the lungs. It is caused by a bacterial microorganism, the tubercle bacillus or Mycobacterium tuberculosis. Although TB can be treated, cured, and can be prevented if persons at risk take certain drugs, scientists have never come close to wiping it out. Few diseases have caused so much distressing illness for centuries and claimed so many lives. Tuberculosis was popularly known as consumption for a long time. Scientists know it as an infection caused by M. tuberculosis. In 1882, the microbiologist Robert Koch discovered the tubercle bacillus, at a time when one of every seven deaths in Europe was caused by TB. Because antibiotics were unknown, the only means of controlling the spread of infection was to isolate patients in private sanitoria or hospitals limited to patients with TB—a practice that continues to this day in many countries. The net effect of this pattern of treatment was to separate the study of tuberculosis from mainstream medicine. Entire organizations were set up to study not only the disease as it affected individual patients, but its impact on the society as a whole. At the turn of the twentieth century more than 80% of the population in the United States were infected before age 20, and tuberculosis was the single most common cause of death. By 1938 there were more than 700 TB hospitals in this country. Tuberculosis spread much more widely in Europe when the industrial revolution began in the late nineteenth century. The disease became widespread somewhat later in the United States, because the movement of the population to large cities made overcrowded housing so common. When streptomycin, the first antibiotic effective against M. tuberculosis, was discovered in the early 1940s, the infection began to come under control. Although other more effective anti-tuberculosis drugs were developed in the following decades, the number of cases of TB in the United States began to rise again in the mid-1980s. This upsurge was in part again a result of overcrowding and unsanitary conditions in the poor areas of large cities, prisons, and homeless shelters. Infected visitors and immigrants to the United Stateshave also contributed to the resurgence of TB. An additional factor is the AIDS epidemic. AIDS patients are much more likely to develop tuberculosis because of their weakened immune systems. There still are an estimated 8-10 million new cases of TB each year worldwide, causing roughly 3 million deaths. THE ELDERLY. Tuberculosis is more common in elderly persons. More than one-fourth of the nearly 23,000 cases of TB reported in the United States in 1995 developed in people above age 65. Many elderly patients developed the infection some years ago when the disease was more widespread. There are additional reasons for the vulnerability of older people: those living in nursing homes and similar facilities are in close contact with others who may be infected. The aging process itself may weaken the body's immune system, which is then less able to ward off the tubercle bacillus. Finally, bacteria that have lain dormant for some time in elderly persons may be reactivated and cause illness. RACIAL AND ETHNIC GROUPS. TB also is more common in blacks, who are more likely to live under conditions that promote infection. At the beginning of the new millennium, two-thirds of all cases of TB in the United States affect African Americans, Hispanics, Asians, and persons from the Pacific Islands. Another one-fourth of cases affect persons born outside the United States. As of 2002, the risk of TB is still increasing in all these groups. As of late 2002, TB is a major health problem in certain specific immigrant communities, such as the Vietnamese in southern California. One team of public health experts in North Carolina maintains that treatment for tuberculosis is the most pressing health care need of recent immigrants to the United States. In some cases, the vulnerability of immigrants to tuberculosis is increased by occupational exposure, as a recent outbreak of TB among Mexican poultry farm workers in Delaware indicates. Other public health experts are recommending tuberculosis screening at the primary care level of all new immigrants and refugees. LIFESTYLE FACTORS. The high risk of TB in AIDS patients extends to those infected by human immunodeficiency virus (HIV) who have not yet developed clinical signs of AIDS. Alcoholics and intravenous drug abusers are also at increased risk of contracting tuberculosis. Until the economic and social factors that influence the spread of tubercular infection are remedied, there is no real possibility of completely eliminating the disease. Tuberculosis spreads by droplet infection. This type of transmission means that when a TB patient exhales, coughs, or sneezes, tiny droplets of fluid containing tubercle bacilli are released into the air. This mist, or aerosol as it is often called, can be taken into the nasal passages and lungs of a susceptible person nearby. Tuberculosis is not, however, highly contagious compared to some other infectious diseases. Only about one in three close contacts of a TB patient, and fewer than 15% of more remote contacts, are likely to become infected. As a rule, close, frequent, or prolonged contact is needed to spread the disease. Of course, if a severely infected patient emits huge numbers of bacilli, the chance of transmitting infection is much greater. Unlike many other infections, TB is not passed on by contact with a patient's clothing, bed linens, or dishes and cooking utensils. The most important exception is pregnancy. The fetus of an infected mother may contract TB by inhaling or swallowing the bacilli in the amniotic fluid. Once inhaled, tubercle bacilli may reach the small breathing sacs in the lungs (the alveoli), where they are taken up by cells called macrophages. The bacilli multiply within these cells and then spread through the lymph vessels to nearby lymph nodes. Sometimes the bacilli move through blood vessels to distant organs. At this point they may either remain alive but inactive (quiescent), or they may cause active disease. Actual tissue damage is not caused directly by the tubercle bacillus, but by the reaction of the person's tissues to its presence. In a matter of weeks the host develops an immune response to the bacillus. Cells attack the bacilli, permit the initial damage to heal, and prevent future disease permanently. Infection does not always mean disease; in fact, it usually does not. At least nine of ten patients who harbor M. tuberculosis do not develop symptoms or physical evidence of active disease, and their x-rays remain negative. They are not contagious; however, they do form a pool of infected patients who may get sick at a later date and then pass on TB to others. It is thought that more than 90% of cases of active tuberculosis come from this pool. In the United States this group numbers 10-15 million persons. Whether or not a particular infected person will become ill is impossible to predict with certainty. An estimated 5% of infected persons get sick within 12-24 months of being infected. Another 5% heal initially but, after years or decades, develop active tuberculosis either in the lungs or elsewhere in the body. This form of the disease is called reactivation TB, or post-primary disease. On rare occasions a previously infected person gets sick again after a later exposure to the tubercle bacillus. Pulmonary tuberculosis is TB that affects the lungs. Its initial symptoms are easily confused with those of other diseases. An infected person may at first feel vaguely unwell or develop a cough blamed on smoking or a cold. A small amount of greenish or yellow sputum may be coughed up when the person gets up in the morning. In time, more sputum is produced that is streaked with blood. Persons with pulmonary TB do not run a high fever, but they often have a low-grade one. They may wake up in the night drenched with cold sweat when the fever breaks. The patient often loses interest in food and may lose weight. Chest pain is sometimes present. If the infection allows air to escape from the lungs into the chest cavity (pneumothorax) or if fluid collects in the pleural space (pleural effusion), the patient may have difficulty breathing. If a young adult develops a pleural effusion, the chance of tubercular infection being the cause is very high. The TB bacilli may travel from the lungs to lymph nodes in the sides and back of the neck. Infection in these areas can break through the skin and discharge pus. Before the development of effective antibiotics, many patients became chronically ill with increasingly severe lung symptoms. They lost a great deal of weight and developed a wasted appearance. This outcome is uncommon today—at least where modern treatment methods are available. Bones. TB is particularly likely to attack the spine and the ends of the long bones. Children are especially prone to spinal tuberculosis. If not treated, the spinal segments (vertebrae) may collapse and cause paralysis in one or both legs. Kidneys. Along with the bones, the kidneys are probably the commonest site of extrapulmonary TB. There may, however, be few symptoms even though part of a kidney is destroyed. TB may spread to the bladder. In men, it may spread to the prostate gland and nearby structures. Female reproductive organs. The ovaries in women may be infected; TB can spread from them to the peritoneum, which is the membrane lining the abdominal cavity. Abdominal cavity. Tuberculous peritonitis may cause pain ranging from the vague discomfort of stomach cramps to intense pain that may mimic the symptoms of appendicitis. Joints. Tubercular infection of joints causes a form of arthritis that most often affects the hips and knees. The wrist, hand, and elbow joints also may become painful and inflamed. Meninges. The meninges are tissues that cover the brain and the spinal cord. Infection of the meninges by the TB bacillus causes tuberculous meningitis, a condition that is most common in young children but is especially dangerous in the elderly. Patients develop headaches, become drowsy, and eventually comatose. Permanent brain damage is the rule unless prompt treatment is given. Some patients with tuberculous meningitis develop a tumor-like brain mass called a tuberculoma that can cause stroke-like symptoms. Skin, intestines, adrenal glands, and blood vessels. All these parts of the body can be infected by M. tuberculosis. Infection of the wall of the body's main artery (the aorta), can cause it to rupture with catastrophic results. Tuberculous pericarditis occurs when the membrane surrounding the heart (the pericardium) is infected and fills up with fluid that interferes with the heart's ability to pump blood. Miliary tuberculosis. Miliary TB is a life-threatening condition that occurs when large numbers of tubercle bacilli spread throughout the body. Huge numbers of tiny tubercular lesions develop that cause marked weakness and weight loss, severe anemia, and gradual wasting of the body. There are many forms of mycobacteria other than M. tuberculosis, the tubercle bacillus. Some cause infections that may closely resemble tuberculosis, but they usually do so only when an infected person's immune system is defective. People who are HIV-positive are a prime example. The most common mycobacteria that infect AIDS patients are a group known as Mycobacterium avium complex (MAC). People infected by MAC are not contagious, but they may develop a serious lung infection that is highly resistant to antibiotics. MAC infections typically start with the patient coughing up mucus. The infection progresses slowly, but eventually blood is brought up and the patient has trouble breathing. In AIDS patients, MAC disease can spread throughout the body, with anemia, diarrhea, and stomach pain as common features. Often these patients die unless their immune system can be strengthened. Other mycobacteria grow in swimming pools and may cause skin infection. Some of them infect wounds and artificial body parts such as a breast implant or mechanical heart valve. The diagnosis of TB is made on the basis of laboratory test results. The standard test for tuberculosis—which is the so-called tuberculin skin test—detects the presence of infection, not of active TB. Tuberculin is an extract prepared from cultures of M. tuberculosis. It contains substances belonging to the bacillus (antigens) to which an infected person has been sensitized. When tuberculin is injected into the skin of an infected person, the area around the injection becomes hard, swollen, and red within one to three days. Today skin tests utilize a substance called purified protein derivative (PPD) that has a standard chemical composition and is therefore is a good measure of the presence of tubercular infection. The PPD test is also called the Mantoux test. The Mantoux PPD skin test is not, however, 100% accurate; it can produce false positive as well as false negative results. What these terms mean is that some people who have a skin reaction are not infected (false positive) and that some who do not react are in fact infected (false negative). The PPD test is, however, useful as a screener. Anyone who has suspicious findings on a chest x ray, or any condition that makes TB more likely should have a PPD test. In addition, those in close contact with a TB patient and persons who come from a country where TB is common also should be tested, as should all healthcare personnel and those living in crowded conditions or institutions. Because the symptoms of TB cover a wide range of severity and affected body parts, diagnosis on the basis of external symptoms is not always possible. Often, the first indication of TB is an abnormal chest x-ray or other test result rather than physical discomfort. On a chest x ray, evidence of the disease appears as numerous white, irregular areas against a dark background, or as enlarged lymph nodes. The upper parts of the lungs are most often affected. A PPD test is always done to show whether the patient has been infected by the tubercle bacillus. To verify the test results, the physician obtains a sample of sputum or a tissue sample (biopsy) for culture. Three to five sputum samples should be taken early in the morning. If necessary, sputum for culture can be produced by spraying salt solution into the windpipe. Culturing M. tuberculosis is useful for diagnosis because the bacillus has certain distinctive characteristics. Unlike many other types of bacteria, mycobacteria can retain certain dyes even when exposed to acid. This so-called acid-fast property is characteristic of the tubercle bacillus. Body fluids other than sputum can be used for culture. If TB has invaded the brain or spinal cord, culturing a sample of spinal fluid will make the diagnosis. If TB of the kidneys is suspected because of pus or blood in the urine, culture of the urine may reveal tubercular infection. Infection of the ovaries in women can be detected by placing a tube having a light on its end (a laparoscope) into the area. Samples also may be taken from the liver or bone marrow to detect the tubercle bacillus. One important new advance in the diagnosis of TB is the use of molecular techniques to speed the diagnostic process as well as improve its accuracy. As of late 2005, four molecular techniques are increasingly used in laboratories around the world. They include polymerase chain reaction to detect mycobacterial DNA in patient specimens; nucleic acid probes to identify mycobacteria in culture; restriction fragment length polymorphism analysis to compare different strains of TB for epidemiological studies; and genetic-based susceptibility testing to identify drugresistant strains of mycobacteria. In the past, treatment of TB was primarily supportive. Patients were kept in isolation, encouraged to rest, and fed well. If these measures failed the lung was collapsed surgically so that it could "rest" and heal. Today surgical procedures still are used when necessary, but contemporary medicine relies on drug therapy as the mainstay of home care. Given an effective combination of drugs, patients with TB can be treated at home as well as in a sanitorium. Treatment at home does not pose the risk of infecting other household members. Lowering the number of bacilli as quickly as possible. This measure minimizes the risk of transmitting the disease. When sputum cultures become negative, this has been achieved. Conversely, if the sputum remains positive afterfive to six months, treatment has failed. Preventing the development of drug resistance. For this reason, at least two different drugs and sometimes three are always given at first. If drug resistance is suspected, at least two different drugs should be tried. Long-term treatment to prevent relapse. Five drugs are most commonly used today to treat tuberculosis: isoniazid (INH, Laniazid, Nydrazid); rifampin (Rifadin, Rimactane); pyrazinamide (Tebrazid); streptomycin; and ethambutol (Myambutol). The first three drugs may be given in the same capsule to minimize the number of pills in the dosage. As of 1998, many patients are given INH and rifampin together for six months, with pyrazinamide added for the first two months. Hospitalization is rarely necessary because many patients are no longer infectious after about two weeks of combination treatment. Follow-up involves monitoring of side effects and monthly sputum tests. Of the five medications, INH is the most frequently used drug for both treatment and prevention. Surgical treatment of TB may be used if medications are ineffective. There are three surgical treatments for pulmonary TB: pneumothorax, in which air is introduced into the chest to collapse the lung; thoracoplasty, in which one or more ribs are removed; and removal of a diseased lung, in whole or in part. It is possible for patients to survive with one healthy lung. Spinal TB may result in a severe deformity that can be corrected surgically. The prognosis for recovery from TB is good for most patients, if the disease is diagnosed early and given prompt treatment with appropriate medications on a long-term regimen. According to a 2002 Johns Hopkins study, most patients in the United States who die of TB are older—average age 62—and suffer from such underlying diseases as diabetes and kidney failure. Modern surgical methods have a good outcome in most cases in which they are needed. Miliary tuberculosis is still fatal in many cases but is rarely seen today in developed countries. Even in cases in which the bacillus proves resistant to all of the commonly used medications for TB, other seldom-used drugs may be tried because the tubercle bacilli have not yet developed resistance to them. General measures such as avoidance of overcrowded and unsanitary conditions are also necessary aspects of prevention. Hospital emergency rooms and similar locations can be treated with ultraviolet light, which has an antibacterial effect. Vaccination is one major preventive measure against TB. A vaccine called BCG (Bacillus Calmette-Guérin, named after its French developers) is made from a weakened mycobacterium that infects cattle. Vaccination with BCG does not prevent infection by M. tuberculosis but it does strengthen the immune system of first-time TB patients. As a result, serious complications are less likely to develop. BCG is used more widely in developing countries than in the United States. The effectiveness of vaccination is still being studied; it is not clear whether the vaccine's effectiveness depends on the population in which it is used or on variations in its formulation. INH can be given for the prevention as well as the treatment of TB. INH is effective when given daily over a period of six to 12 months to people in high-risk categories. INH appears to be most beneficial to persons under the age of 25. Because INH carries the risk of side-effects (liver inflammation, nerve damage, changes in mood and behavior), it is important to give it only to persons at special risk. Beers, Mark H., MD, and Robert Berkow, MD., editors. "Infectious Diseases Caused by Mycobacteria." In The Merck Manual of Diagnosis and Therapy. Whitehouse Station, NJ: Merck Research Laboratories, 2004. Pelletier, Kenneth R., MD. The Best Alternative Medicine, Part II, "CAM Therapies for Specific Conditions: Tuberculosis." New York: Simon & Schuster, 2002. "Changing Patterns of New Tuberculosis Infections." Infectious Disease Alert August 15, 2002: 171-172. "'Drug of Dreams' Preps for First Large-Scale Trail: Study to Begin this Year; Moxifloxacin to Debut Soon in Study 27." TB Monitor July 2002: 73. Efferen, Linda S. "Tuberculosis: Practical Solutions to Meet the Challenge." Journal of Respiratory Diseases November 1999: 772. Fielder, J. F., C. P. Chaulk, M. Dalvi, et al. "A High Tuberculosis Case-Fatality Rate in a Setting of Effective Tuberculosis Control: Implications for Acceptable Treatment Success Rates." International Journal of Tuberculosis and Lung Disease 6 (December 2002): 1114-1117. "Guidelines Roll Out Two New Variations: Experts give Both a Thumbs Up." TB Monitor August 2002: 85. Houston, H. R., N. Harada, and T. Makinodan. "Development of a Culturally Sensitive Educational Intervention Program to Reduce the High Incidence of Tuberculosis Among Foreign-Born Vietnamese." Ethnic Health 7 (November 2002): 255-265. Kim, D. Y., R. Ridzon, B. Giles, and T. Mireles. "Pseudo-Outbreak of Tuberculosis in Poultry Plant Workers, Sussex County, Delaware." Journal of Occupational and Environmental Medicine 44 (December 2002): 1169-1172. Moua, M., F. A. Guerra, J. D. Moore, and R. O. Valdiserri. "Immigrant Health: Legal Tools/Legal Barriers." Journal of Law and Medical Ethics 30, Supplement 3 (Fall 2002): 189-196. "New Drugs Sought for Top Killer of Young Women Worldwide." Women's Health Weekly July 25, 2002: 20. "Poor Patient Compliance Key to Drug Resistance in Tuberculosis." Pulse July 1, 2002: 18. Stauffer, W. M., D. Kamat, and P. F. Walker. "Screening of International Immigrants, Refugees, and Adoptees." Primary Care 29 (December 2002): 879-905. Su, W. J. "Recent Advances in the Molecular Diagnosis of Tuberculosis." Journal of Microbiology, Immunology, and Infection 35 (December 2002): 209-214. National Heart, Lung, and Blood Institute (NHLBI). P. O. Box 30105, Bethesda, MD 20824-0105. (301) 592-8573. www.nhlbi.nih.gov. New York State Department of Health. "Communicable Disease Fact Sheet." an infectious, inflammatory, reportable disease that is chronic in nature and usually affects the lungs (pulmonary tuberculosis), although it may occur in almost any part of the body. The causative agent is Mycobacterium tuberculosis (also known as the tubercle bacillus). Formerly, the only other species of Mycobacterium thought to be pathogenic to humans were M. bovis and M. avium. It is now known that other species can produce diseases similar to true tuberculosis, including M. intracellulare, M. kansasii, M. simiae, and M. szulgai. The most common mode of transmission of tuberculosis in the United States is inhalation of infected droplet nuclei. In some other parts of the world bovine tuberculosis, which is carried by unpasteurized milk and other dairy products from tuberculous cattle, is more prevalent. A rare mode of transmission is by infected urine, especially for young children using the same toilet facilities. Tuberculosis is also seen as an opportunistic infection in human immunodeficiency virus (HIV) infection. The tubercle bacillus is capable of surviving for months in dried sputum that is not exposed to sunlight. Within the body it can lie dormant for decades and then become reactivated years after an initial infection. This secondary tuberculosis infection (endogenous reinfection) can occur at any time the patient's resistance is lowered. For this reason, periodic evaluation for evidence of the disease is extremely important for anyone who has had a primary tuberculosis infection. The tubercle bacillus is destroyed by boiling for 5 minutes, by autoclaving, by contact with coal tar preparations, e.g., phenol, and by ultraviolet radiation. Primary and Secondary Tuberculosis. The first or primary infection with tuberculosis bacilli usually presents no symptoms. In about 99 per cent of those who are infected, the disease remains quiescent after the development of a hypersensitivity to the tuberculin microorganism and is no longer clinically significant. The primary infection usually involves the middle or lower lung area. The primary lesion consists of a small area of exudation in the lung parenchyma (Ghon focus) which quickly becomes caseous (cheeselike) and spreads to the bronchopulmonary lymph nodes, where it gains access to the blood stream. Thus the stage is set for the development of a chronic pulmonary and extrapulmonary tuberculosis at a later time. In most instances, however, a secondary reinfection from inside the body (endogenous) or outside the body (exogenous) does not occur because of the subsequent development of tuberculin hypersensitivity and cellular immunity. The presence of antigen concentrations at the initial site of infection brings about necrosis and eventually fibrosis and calcification of the tissues, which arrests the infection and renders the disease inactive. If, however, the infection is not controlled, the patient develops the symptoms of progressive primary tuberculosis. Secondary tuberculosis develops as a result of either endogenous or exogenous reinfection by the tubercle bacillus. This is the most common form of clinical tuberculosis. In the United States development of secondary tuberculosis is almost always the result of an endogenous reinfection, which occurs when the primary lesion becomes active. This most frequently happens in debilitated persons who have lowered resistance to disease. Resistance to tuberculosis depends on the general health and living conditions of the individual. Poor health, crowded and unsanitary housing, malnutrition, and other illnesses can lower the body's defenses. A second factor that can lead to activation of the disease is frequent exposure to the bacilli or exposure to such numbers that even a healthy person cannot escape infection. Tuberculin Testing. The most commonly used test is the mantoux test, which consists of an intradermal injection of a purified protein derivative of tuberculin. An indurated area (wheal) of 8 to 10 mm in diameter 48 to 72 hours after injection is considered positive. Induration must be present; a reddened area is not indicative of a positive reaction. If the test is positive for tuberculin sensitivity, further studies, including x-rays, are indicated before a definite diagnosis of tuberculosis is established. False negative results can occur with acute viral infections and some neoplastic diseases, e.g., Hodgkin's disease.Culture of M. tuberculosis from sputum or some other body fluid is the only way to positively confirm tuberculosis.
. A child or young person with active tuberculosis usually suffers from one or more of the following symptoms: loss of energy, poor appetite, loss of weight, and fever. Even though these symptoms may have causes other than tuberculosis, they must be regarded as warning signals. In adults, listlessness and vague pains in the chest may go unnoticed, since they are often not severe enough to attract attention. Unfortunately, the symptoms that most people associate with tuberculosis (cough, expectoration of purulent sputum, fever, night sweats, and hemorrhage from the lungs) do not appear in the early, most easily curable stage of the disease; often their appearance is delayed until a year or more after the initial exposure to the bacilli. 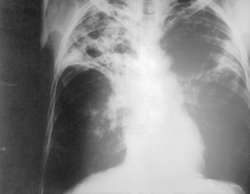 Chronic pulmonary tuberculosis is often accompanied by pleurisy. Pleurisy with effusion often is the first symptom of tuberculosis. In certain cases, complications are possible and each has its characteristic symptoms. At a fairly late stage, the tuberculosis bacillus may cause ulcers or inflammation around the larynx (tuberculous laryngitis). Less often, tuberculous ulcers form on the tongue or tonsils. Sometimes intestinal infections develop; they are probably caused by swallowed bacteria-contaminated sputum. A most serious complication is the sudden collapse of a lung, the indication that a deep tuberculous cavity in the lung has perforated, or opened into the pleural cavity, allowing air and infected material to flow into it. When a fairly large and previously walled-off lesion, or infected area, suddenly discharges its contents into the bronchial tree, the result is the infection of a large part of the lung, an acute and dangerous complication which causes tuberculous pneumonia. Tuberculosis bacilli can spread to other parts of the body by way of the blood, producing miliary tuberculosis. When a large number of bacilli suddenly enter the circulatory system, they are carried to all areas of the body and may lodge in any organ. Minute tubercles form in the tissues of the organs affected; these lesions are about the size of a pinhead or millet seed (hence the name miliary). Unless promptly treated, and occasionally even then, the tiny lesions spread, join, and produce larger areas of infection. Tuberculous pneumonia can begin in this way, as can tuberculosis of any other organ. Miliary infections involving the meninges produce a particularly serious disease; indeed, until the development of antibiotics, this condition nearly always proved fatal. Practically all parts and organs of the body can be secondarily invaded by tubercle bacilli, a common type being involvement of the kidneys, which often spreads to the bladder and genitalia. Bone involvement, particularly of the spine (pott's disease), was once common, especially among children. Lupus vulgaris, or tuberculosis of the skin, is characterized by brown nodules on the corium; another form of tuberculosis of the skin is tuberculosis indurativa, a chronic disease in which indurated nodules form on the skin. When the adrenal glands are affected by tuberculosis, a rare occurrence, the condition can cause addison's disease. Treatment and Care. Most persons with tuberculosis are cared for at home under the supervision of a public health nurse who periodically visits the patient and family. Hospitalization may be required for those patients who experience complications or who are noncompliant with chemotherapy. The importance of compliance with the entire course of chemotherapy should be stressed. Failure to complete chemotherapy is a major factor in the appearance of drug resistant tuberculosis. Masks may be necessary for those having intimate contact with a patient who is just beginning chemotherapy, and in caring for patients who cannot or will not take precautions against spreading the infection. Usually, two to four weeks after medications are begun restrictions are removed regarding activities and contacts. Handwashing is essential to prevention of cross-infection. Fomites are not considered important in the transmission of tuberculosis and so no special precautions are required for eating utensils and other inanimate articles in the patient's room. Screening of family members and other contacts should be done. Standard precautions are used for patients with extrapulmonary tuberculosis and those who have a positive skin test even without evidence of disease. Institutionalized patients with pulmonary or laryngeal disease should be kept on airborne precautions. The Centers for Disease Control and Prevention has published "Guidelines for Preventing the Transmission of Mycobacterium Tuberculosis in Health Care Facilities." The document can be read on their web site at http://www.cdc.gov. Drugs. Isoniazid remains the major antituberculous agent. It is usually administered in combination with rifampin. Ethambutol is added if the patient comes from an area of high resistance. In isoniazid-resistant cases, rifampin is substituted as a companion drug for ethambutol. Other medications are used if resistant organisms have developed. Prevention. The incidence of tuberculosis is rising, and the development of resistant organisms is also rising. It must be stressed that medications must be taken as ordered. The best precautions are (1) maintenance of good health, (2) avoidance of unnecessary exposure to tuberculosis organisms, and (3) detection of the disease in its earliest stages. Tuberculosis. The Ghon complex, typical of pulmonary tuberculosis, consists of a parenchymal focus and hilar lymph node lesions. The detailed section of the diagram shows typical features of tuberculous granuloma: central caseous necrosis surrounded by epithelioid cells, multinucleated giant cells, and lymphocytes. From Damjanov, 2000.
avian tuberculosis a form affecting various birds, due to Mycobacterium avium, which may be communicated to humans and other animals. Individuals with impaired immunity have particular susceptibility to this infection. bovine tuberculosis an infection of cattle caused by Mycobacterium bovis, transmissible to humans and other animals. hematogenous tuberculosis that carried through the blood stream from the primary site of infection to other organs. miliary tuberculosis an acute form of tuberculosis in which minute tubercles are formed in a number of organs of the body, owing to dissemination of the bacilli throughout the body by the bloodstream. 1. that in which there are lesions from which tubercle bacilli are being discharged out of the body. 2. tuberculosis of the lungs with cavitation. 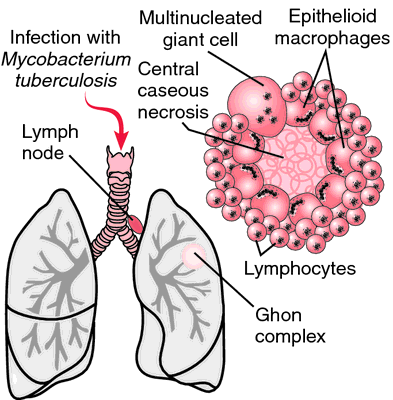 pulmonary tuberculosis infection of the lungs by Mycobacterium tuberculosis; the first infection is usually quiescent, and it may develop later into tuberculous pneumonia and other conditions. See tuberculosis. renal tuberculosis disease of the kidney due to Mycobacterium tuberculosis, usually from bacillemia in cases of pulmonary tuberculosis. Pathological changes include granulomatous inflammation and caseous necrosis of kidney tissue. Called also nephrotuberculosis. tuberculosis verruco´sa cu´tis (warty tuberculosis) a condition usually resulting from external inoculation of the tubercle bacilli into the skin, with wartlike papules that coalesce to form patches with a reddened inflammatory border. A specific disease caused by infection with Mycobacterium tuberculosis, the tubercle bacillus, which can affect almost any tissue or organ of the body, the most common site of the disease being the lungs. Primary TB is typically a mild or asymptomatic local pulmonary infection. Regional lymph nodes may become involved, but in otherwise healthy people generalized disease does not immediately develop. A cell-mediated immune response arrests the spread of organisms and walls off the zone of infection. Infected tissues and lymph nodes may eventually calcify. The tuberculin skin test result becomes positive within a few weeks and remains positive throughout life. Organisms in a primary lesion remain viable and can become reactivated months or years later to initiate secondary TB. Progression to the secondary stage eventually occurs in 10-15% of people who have had primary TB; in one half of these, progression occurs within 2 years. The risk of reactivation is increased by diabetes mellitus, malnutrition, HIV infection, silicosis, and various systemic or malignant conditions, as well as in patients with alcoholism, IV drug abusers, nursing home residents, and those receiving adrenocortical steroid or immunosuppressive therapy. Secondary or reactivation TB usually results in a chronic, spreading lung infection, most often involving the upper lobes. Minute granulomas (tubercles), just visible to the naked eye, develop in involved lung tissue, each consisting of a zone of caseation necrosis surrounded by chronic inflammatory cells (epithelioid histiocytes and giant cells). These lesions, which give the disease its name, are also found in other tissues (lymph nodes, bowel, kidney, skin) to which the disease may spread. Rarely, reactivation results in widespread dissemination of tubercles throughout the body (miliary TB). The symptoms of active pulmonary TB are fatigue, anorexia, weight loss, low-grade fever, night sweats, chronic cough, and hemoptysis. Local symptoms depend on the parts affected. Active pulmonary TB is relentlessly chronic and, if untreated, leads to progressive destruction of lung tissue. Cavities form in the lungs, and erosion into pulmonary blood vessels can result in life-threatening hemorrhage. Gradual deterioration of nutritional status and general health culminates in death due to wasting, infection, or multiple organ failure. Variant syndromes (tuberculous lymphadenitis in children, severe systemic disease in persons with AIDS) are caused by organisms of the Mycobacterium avium-intracellulare complex (MAIC). The diagnosis of TB is based on tuberculin skin testing (negative in 20% of people with active TB), imaging studies (computed tomography is more sensitive than standard chest radiography in detecting pleural effusion, miliary disease, and cavitation), and the finding of the causative organism in sputum or tissue specimens by acid-fast or fluorochrome staining, nucleic acid amplificatin, or culture. In 1993 the World Health Organization (WHO) declared TB a global emergency. Fully one third of the world's population is infected with TB. On a global scale, TB ranks first among infectious diseases as a cause of death. Two thirds of all the world's cases are in Asia, but the disease is also endemic in parts of Africa (where the highest incidence rates per capita are found) and eastern Europe. War and social upheaval have played a role in the spread of tuberculosis beyond endemic zones. Prevalence of infection is higher among refugees and immigrants. One third of all people with tuberculosis in the U.S. were born outside this country, and more than 50% of newly diagnosed cases occur in people of foreign birth. From the 1950s, when antibiotics began to be used for the treatment of TB, until the 1980s, the incidence and mortality of the disease declined steadily in the U.S. During the 1980s the incidence began to rise because of many new cases in people with AIDS and because of increasing prevalence of multidrug-resistant strains of M. tuberculosis. Since 1993 the figures have again declined, chiefly because of improvements in TB prevention and control programs in state and local health departments as a result of increased federal funding provided to states. At least one third of people with AIDS contract TB, and TB is the cause of death in one third of people who die of AIDS. Because antibiotic resistance in M. tuberculosis has been a growing problem for years, multidrug regimens, usually including isoniazid, rifampin, and pyrazinamide, are standard. Other drugs, such as ethambutol, streptomycin, kanamycin, and capreomycin, may be added or substituted. The success of treatment is limited not only by the resistance of organisms to several agents but also by the risk of severe toxic effects with all standard agents. Unlike most infections treated with antibiotics, TB requires not merely days or weeks of treatment but rather months and years. Long-term compliance with treatment regimens tends to be poor among mobile, indigent, and uneducated people. According to WHO, the principal reason for the spread of multidrug-resistant strains of M. tuberculosis is ineffectual management of TB control programs, particularly in developing countries. An inappropriate or unfinished course of chemotherapy not only leaves the patient still sick and still contagious, but favors the selection of resistant bacteria. It is estimated that 50 million of the world's cases of TB involve multiply resistant tubercle bacilli. The prevalence of infection due to drug-resistant strains is particularly high in some former Soviet states. Currently WHO urges that TB programs worldwide adopt the practice of directly observed therapy (DOT), in which a health care worker observes each patient swallowing each dose of medicine. In a study performed at several U.S. centers, DOT for TB was found to be cost effective when the cost of relapses and treatment failures was added to the cost of self-administered therapy, even though the raw cost of DOT was higher. U.S. public health authorities have established as a national goal the elimination of TB (defined as an incidence of less than 1 case per 1 million population) by 2010. /tu·ber·cu·lo·sis/ (-sis) any of the infectious diseases of humans and other animals due to species of Mycobacterium and marked by formation of tubercles and caseous necrosis in tissues of any organ; in humans the lung is the major seat of infection and the usual portal through which infection reaches other organs. avian tuberculosis a form affecting various birds, due to Mycobacterium avium, which may be communicated to humans and other animals. bovine tuberculosis an infection of cattle due to Mycobacterium bovis, transmissible to humans and other animals. disseminated tuberculosis an acute form of miliary t.
genital tuberculosis tuberculosis of the genital tract, e.g., tuberculous endometritis. tuberculosis of lungs pulmonary t.
miliary tuberculosis a form varying in severity, in which minute tubercles form in different organs due to dissemination of bacilli through the body by the blood stream. 1. that in which there are lesions from which tubercle bacilli are discharged out of the body. 2. pulmonary tuberculosis with cavitation. pulmonary tuberculosis tuberculosis of lungs; infection of the lungs by Mycobacterium tuberculosis, with tuberculous pneumonia, formation of tuberculous granulation tissue, caseous necrosis, calcification, and cavity formation. Symptoms include weight loss, fatigue, night sweats, purulent sputum, hemoptysis, and chest pain. renal tuberculosis renal disease due to Mycobacterium tuberculosis. spinal tuberculosis osteitis or caries of vertebrae, usually as a complication of pulmonary tuberculosis. tuberculosis verruco´sa cu´tis , warty tuberculosis a condition usually due to external inoculation of tubercle bacilli into the skin, with wartlike patches having an inflammatory, erythematous border. 1. An infectious disease of humans and animals caused by the tubercle bacillus and characterized by the formation of tubercles on the lungs and other tissues of the body, often developing long after the initial infection. 2. Tuberculosis of the lungs, characterized by the coughing up of mucus and sputum, fever, weight loss, and chest pain. a chronic granulomatous infection caused by an acid-fast bacillus, Mycobacterium tuberculosis. It is generally transmitted by the inhalation or ingestion of infected droplets and usually affects the lungs, although infection of multiple organ systems occurs. Persons who are immunodeficient, such as those infected with human immunodeficiency virus, may have extrapulmonary tuberculosis. This includes disseminated tuberculosis, which involves multiple organs such as the liver, lung, spleen, bone marrow, and lymph nodes. Diagnosis is through biopsy, stain, sputum and gastric cultures, and x-ray studies. Central nervous system tuberculosis may occur as inflammation of the meninges or a mass lesion (tuberculoma). observations Listlessness, vague chest pain, pleurisy, anorexia, fever, and weight loss are early symptoms of pulmonary tuberculosis. Night sweats, pulmonary hemorrhage, expectoration of purulent sputum, and dyspnea develop as the disease progresses. The lung tissues react to the bacillus by producing protective cells that engulf the disease organism, forming tubercles. Untreated, the tubercles enlarge and merge to form larger tubercles that undergo caseation, eventually sloughing off into the cavities of the lungs. Hemoptysis occurs as a result of cavitary spread. interventions The bacillus is generally sensitive to isoniazid, pyrazinamide, paraaminosalicylic acid, streptomycin, rifampin, ethambutol, dihydrostreptomycin, ultraviolet radiation, and heat. A combination of drugs is prescribed, with regular tests of the function of the kidneys, liver, eyes, and ears to discover early signs of drug toxicity. This is particularly important because drug therapy will usually continue for up to 1 year. The person may be hospitalized for the first weeks of treatment to limit the possible spread of infection, to encourage rest and excellent nutrition, to ensure complete compliance with the prescribed drug regimen, and to observe for adverse drug effects. Samples of sputum are regularly examined. The disease is not infectious after the bacillus is no longer present in the sputum. Care of an outpatient includes continued medication, evaluation for adverse drug effects, sputum analyses, and encouragement to complete the long course of treatment. All contacts are tested periodically with purified protein derivative. People who are at increased risk of infection may be treated empirically, without a positive diagnosis having been made. BCG vaccination has been widely used worldwide but may not be effective at preventing tuberculosis. nursing considerations Before discharge the patient is taught how to prevent the spread of the disease; the elements of good nutrition; the name, dose, action, and side effects of all medications prescribed; the need to take the drugs regularly; and how and where to get the next supply of drugs. Plans for follow-up care are discussed; they include date, time, and place of the next laboratory tests; referral to community nurses is made. The patient is reminded that a cough, weight loss, fever, night sweats, and hemoptysis are danger signals that are to be reported immediately. See also miliary tuberculosis, tuberculin test. Infectious disease A disease first known to the ancients; there are one million new cases of Mycobacterium tuberculosis/yr worldwide, of which ±10% of those in developing nations eventually die; 'smear'-positive cases in Africa–165/105, are more often clinically inactive than those in Asia where the rate is 110/105 US incidence: 9.3 cases/105–white/Hispanic 5.7/105, black 26.7/105, Asian 49.6/105; the previous trend of ↓ TB in the US reversed itself in the mid-1980s, due to ↑ of M tuberculosis and M avium complex in AIDS; up to 10 million in the US have latent TB–many of whom are poor, aged, malnourished; homeless or IVDAs Clinical Coughing, chest pain, hemoptysis, weight loss, fatigue, malaise, fever, night sweats Diagnosis Ziehl-Neelsen or Kinyoun AFB stains, viewed by LM; auramine-rhodamine stain with fluorescent microscopy; NAP test, nucleic acid probes, PCR Treatment-1º drugs Isoniazid, ethambutol, rifampicin, streptomycin 2º drugs Ethionamide, capreomycin, kanamycin, cycloserine, pyrazinamide, para-aminosalicylic acid. See Latent tuberculosis, MOTT, Mycobacterial infection, Multidrug resistant tuberculosis, Runyon classification. Cf Pseudotuberculosis. A specific disease caused by Mycobacterium tuberculosis, which may affect almost any tissue or organ of the body, with the most common seat of the disease being the lungs; the anatomic lesion is the tubercle, which can undergo caseation necrosis; general symptoms are those of sepsis: hectic fever, sweats, and emaciation; often progressive, with high mortality if not treated. People with compromised immune systems, including those with AIDS, are at increased risk of severe infection. A high incidence also exists among injecting drug abusers. An infectious disease caused by the tubercle bacillus, Mycobacterium tuberculosis, and characterized pathologically by inflammatory infiltration, formation of tubercles, caseation, necrosis, abscesses, fibrosis, and calcification. It most commonly affects the respiratory system, but other parts of the body such as the gastrointestinal and genitourinary tracts, bones, joints, nervous system, lymph nodes, and skin may also become infected. Fish, amphibians, birds, and mammals (esp. cattle) are subject to the disease. Three types of the tubercle bacillus exist: human, bovine, and avian. Humans may become infected by any of the three types, but in the U.S. the human type predominates. Infection usually is acquired from contact with an infected person or an infected cow or through drinking contaminated milk. In the U.S., about 10 to 15 million persons have been infected with tuberculosis. In 2005 about 14,000 active cases were reported. In 2009, 11,545 new cases were reported in the U.S. Worldwide, about 2 billion people harbor the infection; about 9 million have active disease, and an estimated 2 million die from TB each year. The percentage of drug-resistant TB cases varies internationally. Tuberculosis usually affects the lungs, but the disease may spread to other organs, including the gastrointestinal and genitourinary tracts, bones, joints, nervous system, lymph nodes, and skin. Macrophages surround the bacilli in an attempt to engulf them but cannot, producing granulomas with a soft, cheesy (caseous) core. From this state, lesions may heal by fibrosis and calcification and the disease may exist in an arrested or inactive stage. Depending on the person’s immune status and other factors, the disease may become reactivated as pulmonary TB or disseminated infection. Reactivation or exacerbation of the disease or reinfection gives rise to the chronic progressive form. The incidence of TB declined steadily from the 1950s to about 1990, when the acquired immunodeficiency syndrome (AIDS) epidemic, an increase in the homeless population, an increase in immigrants from endemic areas, and a decrease in public surveillance caused a resurgence of the disease. Populations at greatest risk for TB include patients with human immunodeficiency virus (HIV), Asian and other refugees, the urban homeless, alcoholics and other substance abusers, persons incarcerated in prisons and psychiatric facilities, nursing home residents, patients taking immunosuppressive drugs, and people with chronic respiratory disorders, diabetes mellitus, renal failure, or malnutrition. People from these risk groups should be assessed for TB if they develop pneumonia; all health care workers should be tested annually. Approx. 4 to 12 weeks elapse between the time of infection and the time a demonstrable primary lesion or positive tuberculin skin test (TST) occurs. Pulmonary TB produces chronic cough, sputum, fevers, sweats, and weight loss. TB may also cause neurological disease (meningitis), bone infections, urinary bleeding, and other symptoms if it spreads to other organs. TB is a major cause of infertility around the world. Tests used to diagnose latent infection with tuberculosis include a positive tuberculin skin test (TST) or a blood assay. A presumptive diagnosis of active disease is made by finding acid-fast bacilli in stained smears from sputum or other body fluids. The diagnosis is confirmed by isolating M. tuberculosis in cultures or rapid nucleic acid test probes. All patients with HIV should be tested for TB, and all patients with TB should be tested for HIV, because about one fourth of all patients with one disease will be infected with the other. All patients suspected of or confirmed to have TB should be placed in airborne isolation until they are no longer infectious. Health care professionals and visitors should wear particulate respirators when in the patient’s room. Patients should be taught to cough and sneeze into tissues, and to dispose of secretions in a lined bag taped to the side of the bed or in a covered disposal. The patient should wear a mask when outside the isolation room for any reason. Patients should be observed for complications such as hemoptysis, bone or back pain, and bloody urine. The patient and family or other support persons should be taught about the importance of regular follow-up visits, of following and completing the treatment regimen exactly as prescribed, of adverse effects to be reported, and of signs and symptoms of recurring TB. Persons who have been exposed to an infected patient should receive a TB test; chest x-rays and prophylactic INH also may be prescribed. A mycobacterial infection of birds caused by species including Mycobacterium avium. or M. genavense. 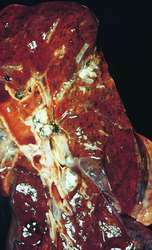 Tuberculosis of cattle caused by Mycobacterium bovis. Tuberculosis that reactivates after a previous infection. Tuberculosis originating from a source outside the body. The spread of tuberculosis from a primary site to another site via the bloodstream. Infection with tuberculosis without active lung disease. It is detected by tuberculin skin testing. Tuberculosis that spreads throughout the body via the bloodstream. It may be fatal. Mycobacterium tuberculosis bacilli that are resistant to therapy with at least two standard antitubercular drugs (esp. isoniazid and rifampin, the two drugs that have formed the cornerstone of therapy for tuberculosis). MDR-TB must be treated with at least three antitubercular drugs to which the organism is presumed or proven to be sensitive. About 3% of cases of TB are drug-resistant. Tuberculosis in which the tubercle bacilli are present in bodily secretions that leave the body. Infection with the organism Mycobacterium tuberculosis , either in the lungs (pulmonary tuberculosis) or in the LYMPH NODES (tuberculous ADENITIS), the skin (SCROFULA), the bones or in other organs. Pulmonary tuberculosis is usually acquired by aerosol spread from other people, while general (systemic) tuberculosis is transmitted in milk from cows with bovine tuberculosis. Pulmonary tuberculosis causes fever, fatigue, loss of appetite and weight, night sweats and persistent cough often with blood-streaked sputum and may spread to cause tubercular MENINGITIS or generalized (miliary) tuberculosis. Systemic tuberculosis causes areas of local tissue destruction often with SINUSES that discharge pus to the exterior. Tuberculosis is treated with a range of drugs used in various combinations for periods of up to a year. Antituberculous drugs include streptomycin, isoniazid, para-aminosalicylic acid (PAS), rifampicin, ethambutol and pyrazinamide. a contagious human disease (the consumption of Victorian times) affecting particularly the lungs, that is caused by the bacterium Mycobacterium tuberculosis. Response to infection is varied amongst individuals, some showing no signs while a few will die of the effects, these variations in host resistance being under genetic control. Tuberculosis is endemic in many parts of the world but, since the introduction of drugs and immunization with vaccines such as BCG, the world death rate has declined dramatically. A typical European mortality rate in 1900 was 190 per 100 000. This dropped to around 10 per 100 000 but is increasing worldwide due to the spread of AIDS. A specific disease caused by infection with Mycobacterium tuberculosis, the tubercle bacillus, which can affect almost any tissue or organ of the body; most common site is in the lungs. M. tuberculosis and characterized by the formation of tubercles in the tissues. n type that no longer responds to treatment due to incomplete or improper use of medication. n a recurrence in a patient who has been symptom free for a period of years. Reactivation tuberculosis usually responds to treatment. applied generally to diseases caused by tuberculous group of bacteria in the genus Mycobacteria, which includes Mycobacteria tuberculosis, M. bovis and M. avium. See also fish tuberculosis, mycobacteriosis. see Mycobacterium avium tuberculosis (below). see Mycobacterium bovis tuberculosis (below). infection with Mycobacterium tuberculosis uncommonly involves the skin; in dogs and cats it can occur as cutaneous ulcers, abscesses, plaques and nodules. More often, the term is used to describe infection with atypical mycobacteria. causes a significant disease only in birds. In birds it is a chronic disease characterized by loss of body weight, poor egg production and eventual death. There are characteristic large gray, yellow or white tubercles in liver, spleen and intestinal wall. The disease is very persistent in a flock. In mammals it causes nonprogressive lesions, especially in lymph nodes, causing the animals to be positive to the tuberculin test. a chronic disease characterized by the development of tubercles or discrete nodular lesions in any organ. These may develop a necrotic center containing yellow-orange pus, often caseous. Diffuse involvement of lungs causing bronchopneumonia, and of uterus causing metritis, and of the udder also occur. The common clinical syndrome is wasting with localizing signs dependent on the organs involved. A common lesion in horses is osteomyelitis of a cervical vertebra. infection with the human mycobacteria causes transient, usually lesionless infections in animals. is characterized by chronic indurated lesions on the skin of the lower limbs of cattle. There are nodules on the path of corded lymphatics. Nonpathogenic acid-fast bacteria are present in the lesions and affected cattle are positive to the tuberculin test. Also occurs uncommonly in dogs and cats as single or multiple nodules, ulcers, abscesses or plaques in the skin. See also mycobacteriosis. Q. Can a low back pain start from picking up something from the oven? My mother has a low back pain. It started five days ago while she picked up a cake from the oven. the pain is always there, it bugs her while she sleeps and it excruciate while she is doing her regular physical activity. What can it be? should we go to our GP? Is there anything we can do to ease the pain except Tylenol? Just for the record my mom is 69 years old, and she has tuberculosis and a heart disease. A. This is a case where your mom should have an examination by a professional. A chiropractor would be the specialist to deal with back pain and can make any appropriate referrals if necessary.